The Apple Watch. To Buy or Not to Buy? That's Always the Question. Do I need this computer on my wrist? Hell if I know. I still don't know if I need an iPhone in my pocket but you convinced me anyway. This watch will probably sell big because it will make people feel like superheroes. Now if you can combine a computer with a Trapper Keeper, call me, I'd be all in for that baby! I read Between the World and Me by Ta-Nehisi Coates over the course of three days. He is a tremendously talented writer. His book reads like poetry and history. At other times it reads like a memoir. Above all it is a letter to his son. I definitely recommend it and can assure you it will stay in my brain, like Derrick Bell's Faces at the Bottom of the Well (a book that Coates references in Between the World and Me). I think it's an important book that people will be talking about for a long time. No part of me would react by telling Coates he distorts history and I certainly wouldn't lecture him about the American Dream, as David Brooks did. The book puts me in a deeply reflective mode. It's a serious book and I hope to be able to talk about it in serious ways with friends and colleagues who've read it. I also want my sons to read it when they get older. I have written about my sons (ages 7 and 4) on this blog in whimsical ways. Look through the blog if you care and see them having fun and see me celebrating them. I have imagined myself writing letters of my own to them some day. In fact, one of the reasons I keep this blog is so they can see what their father was up to for a stretch of his life if they are moved to do so. If I were to write a book with them in mind some day, it would sound almost totally different from what Coates wrote, and that's one of the points of his book. Different positions in American society lead to different vantage points about America. I can't tell Ta-Nehisi Coates what to think about the American Dream. It would be wrong and arrogant for me to do. I think he knows more about the American Dream than David Brooks. I think he knows more about America than I ever will. As we know, there are no days off in sociology. Every day is a good day to use our sociological imaginations. The 4th of July presents a nice opportunity. Keep an eye on how people perform patriotism. Maybe it's flags in their yard. Maybe they're wearing red, white, and blue. Maybe they're roaming through the streets chanting U.S.A. U.S.A. Okay, probably not the last one. Will you be attending a cookout-barbecue? If so, pay attention to who does the grilling. Will it be a fella who "mans" the grill? How is the work shared at the party? Who's watching the kids and engaging them in fun activities? Is drinking taking place? If so, do you notice a difference between what men and women are drinking, or is it Bud Light for everyone? Any party is a good party to observe what people are talking about--aside from actually participating in conversation, I like to observe if people are talking about work, sports, family, politics, celebrities, etc. So while you have some beverages and devour hot dogs (or is your party more upscale? ), put on your sociological thinking cap and analyze the fine and awkward art of social interaction! I'd be honored if you share your observations with me sometime. I think we all know there's a song on the radio that doesn't make any sense. There is a clean version and an explicit one. The clean version keeps popping up when I drive around town. I can't make it through the entire song, nor can I actually summon the courage to read all of the lyrics for proper content analysis, but as a trained social scientist I am comfortable making the conclusion that no empirical evidence exists to warrant the assertion that this summer will hurt like a mother. Those fellas can continue making trillions of dollars but just know it is under false pretenses. You Call This a Sociology Blog?!?! Earlier this year, I claimed that this blog had come to an end. I am back, until I am not. 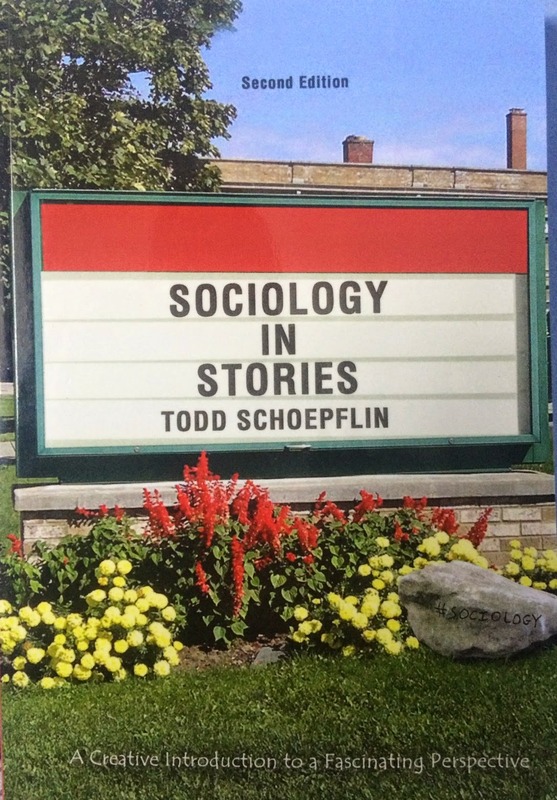 I am like the Brett Favre of sociology blogging, except not really. I wanted to share a recipe for a somewhat tasty and healthy dish that I made last night. My wife saw the recipe on Facebook. Thanks, Zuckerberg, for all the ways you enhance our lives. This recipe features two ingredients that I don't usually eat (orzo and arugula). They're ingredients I didn't know as a youngster and ones that haven't showed up much in my adult life. But they're easy enough to work with. 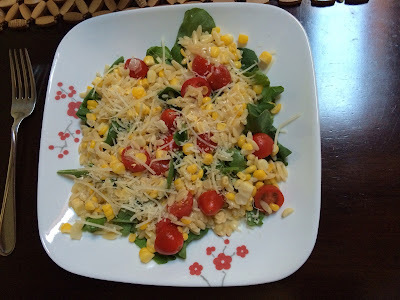 I don't love arugula (#TeamIceberg #TeamRomaine) but it works well in this recipe. So here's what you do. Cook fresh corn however you prefer. Grill if you're a boss, or boil them if you're me. Then shave off the beautiful kernels. Then throw orzo in boiling water. While the orzo is cooking, saute onions in olive oil. When the onions have softened, mix in the corn. Slice up grape tomatoes. When you strain the orzo, toss it with olive oil and squeeze in some fresh lemon juice. Lay down the arugula on the plate. Then the orzo and onion/corn mix. Then sprinkle with tomatoes and fresh Parmesan cheese. Do not use Kraft Parmesan! Use the fresh stuff. There are probably ways to enhance this dish by way of spices, herbs, or, as my beautiful wife suggested, pine nuts. Do what you think is right. Here's how it came out. Sorry for the glare in the picture. On a scale of one to yum, I rate it yum. There's something delightful about this interview. I think it's the way Eminem plays along in an understated manner and the way Stephen Colbert sings Bob Seger tunes. It could also be that the interview takes place on public access television, a refreshing change of pace from the usual corporate-infused venues. The interview has the air of two guys who know they have it very good to be famous in America. It's as if they know this interview would go viral because people like me are so easily amused.